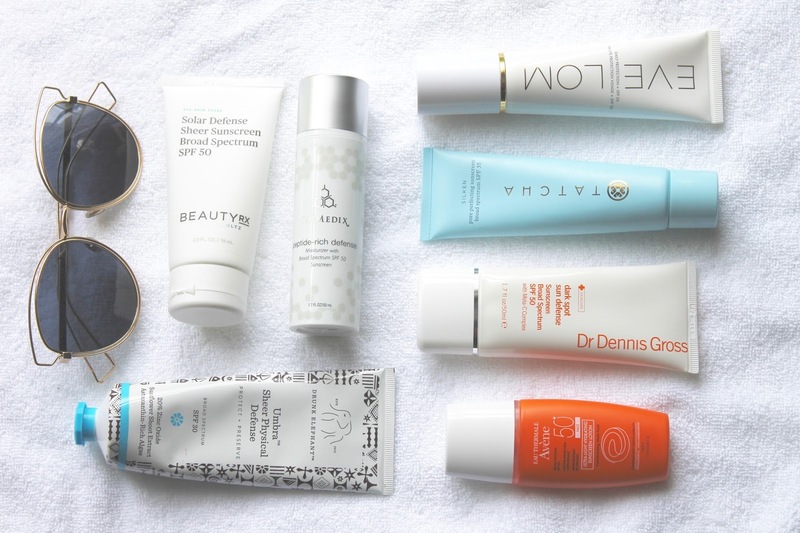 The Day Cream + SPF Hybrids - It seems as though this category would be quite ideal when it comes to day-to-day sun protection. Who doesn't want to kill two birds with one stone? I definitely do, but until I discovered these guys I didn't really have one in my stash that floated my boat. The Eve Lom Daily Protection + SPF 50 feels ultra hydrating, yet is oil-free and manages to sink in immediately and boasts quite the hefty dose of sun protection (50, which is the most I'll usually go for). For anyone who worries about sun damage and hyper-pigmentation, the Dr. Dennis Gross Dark Spot Sun Defense SPF 50 works wonders at brightening skin and keeping any dark spots or splotchiness at bay. I love how it's fluid enough to massage in quickly but keeps the skin comfortably hydrated. Another favorite, the Cosmedix Peptide Rich Defense is great for those with dehydrated skin, but who still don't want to look too shiny or oily. It plumps up the skin and feels just like an ultra-nourishing day cream, that just happens to have an added SPF of 50. Think of this one as the anti-aging superstar in the sunscreen game. The "You can't tell your wearing any" Fluid Sunscreens - If you have your day cream down pat, and are just in search of some extra protection, these guys are for you. The Beauty Rx by Dr. Neal Schultz Solar Defense Sheer Sunscreen SPF 50 is ideal for toting in your beach bag because it's so lightweight you can get away with reapplying all day long. It's suited perfectly to oily-combination skins, but also doesn't feel drying on dehydrated skin whatsoever. I love how it sits under makeup and that I can't even tell I'm wearing it at all. If you're looking for a "green" alternative to sunscreen, but don't want to sacrifice on formula, the Drunk Elephant Umbra Sheer Physical Defense is a really good one to keep on hand. I like that it has an illuminating quality to it, and it's jam packed with antioxidants and good-for-your skin ingredients. This one is a bit more moisturizing though, so if you are worried about oil build up I'd stick with the previous Beauty Rx option. Last, but definitely not least is the French pharmacy classic Avene Ultra-Light Hydrating Sunscreen Lotion SPF 50. This is the most fluid of the bunch - so much so that it is almost runny. That doesn't mean it's not one of my favorites, though. It's one I've always got on hand because it gives my skin the perfect dose of moisture and doesn't interfere with makeup. It's even safe to say that this was the one that made it easier to begin wearing SPF on a regular basis as well because of the comfort and beautiful finish. It also comes in a teeny bottle that shakes up and is the perfect size for traveling (even if you're going carry-on style) and summer getaways. The Pore Blurring Sunscreen - I was almost tempted to give this a category of it's own and call it "more Tatcha perfection" but instead, let's go with pore-blurring. 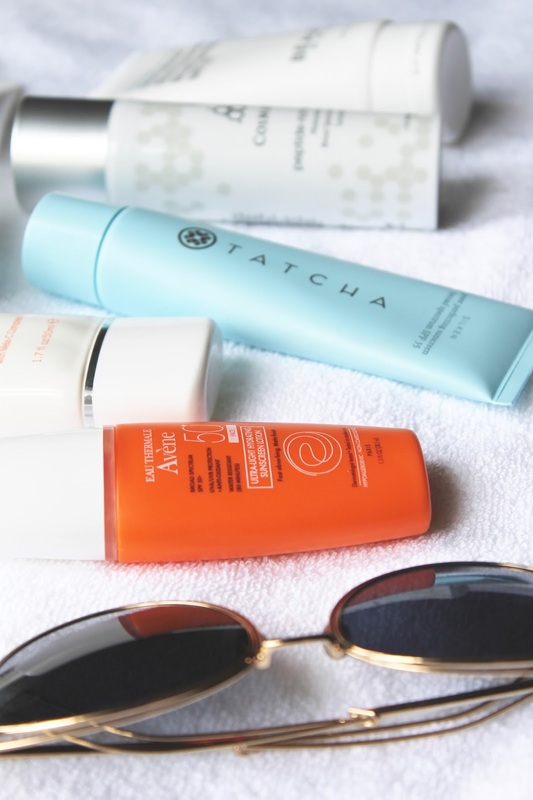 I've devoted an entire post to the wondrous Tatcha Silken Pore Perfecting Sunscreen SPF 35 in the past. If you're interested, you can find it here. But, allow me to reiterate just how much I love this stuff. I use this as a replacement for primers during the warmer months, as it really seems primer is the perfect step in which to incorporate sun protection. Not only is it great because it's a two-in-one, but I'd even use this if it didn't include an SPF. It's silky, lightweight, but hydrating enough to allow makeup to glide on perfectly afterward...all while blurring pores and imperfections. Dare I say, they've made sunscreen a joy to wear? Well, it's true.